In January 2017, the PAN Board hired PAN member, Patty Love, for our first paid staff position – a very part-time Coordinator and Board Assistant. She is barefoot whenever possible! Wishes she could grow cacao! This is the first MailChimp newsletter she has laid out. 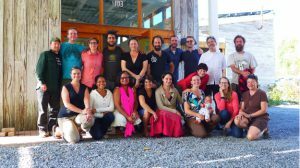 On February 25, 2017, 18 Permaculture educators and practitioners came together to discuss the continued improvement of Permaculture education opportunities in the northeast. Now that Permaculture, historically a fringe movement, has entered mainstream venues, conversations centered around community education standards and qualifications have sprouted within the network and grown. PAN has been organizing these conversations among teachers and practitioners for the past three years. 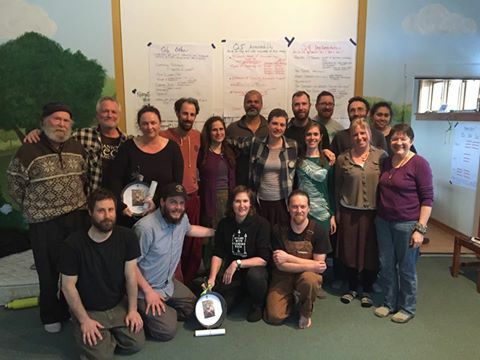 The focus of the most recent winter retreat, hosted by D Acres Permaculture Farm & Homestead in Rumney, NH, was to collaboratively develop voluntary and community-driven pilot education standards inspired by and for the northeastern permaculture network. The group identified collective education standards as serving multiple purposes: to ensure our actions align with our intent as teachers, to provide a framework of best practices, to support a community of Permaculture practitioners, to produce clear processes for professional development, and to promote a culture of improvement by creating positive feedback loops within education. A beautiful aspect of the Permaculture movement is its functioning as a decentralized, and ideally, self-organizing system. The purpose of clearly defined standards is to improve redundancy and consistency, an important part of any ecosystem. The group found it important to define education standards in a way that would improve quality of education without stifling creativity and/or autonomy among teachers and to create a process of developing standards that is iterative and inclusive. Ultimately, all of us as educators want to ensure Permaculture practitioners, from beginners to seasoned veterans, receive high-quality educational experiences that provide them skills and knowledge to participate in earth and community based restoration work. Determining what content is most imperative for educators to communicate about when teaching permaculture was an important part of the day’s conversation. The group determined that there were different considerations for content depending on the educational format that the educator was planning for (i.e. introductory workshop, PDC, advanced PDC, etc.). Such considerations based on format included the depth of core content to be taught (ethics, principles, process, systems thinking) and core curriculum topics (soil, water, plants, etc.). Regardless of the format, the group found it vitally important that educators integrate the history of land and people into the course content, that they create an inclusive space that builds relationships among participants, that learning outcomes are clearly defined, and that all types of learning styles are considered in the planning stages. Some agreed upon teaching ethics the group discussed included promoting inclusion, being respectful, celebrating diversity, ensuring accessibility, creating an interactive experience, embracing knowledge of place, and embodying ethics. Conduct direct outreach to other permaculture teachers and practitioners in the region not present that should be part of this conversation and receive feedback from them. Post pilot standards to website and publicize via press release, etc. Create a voluntary “PAN Pledge” where teachers can apply to become a “PAN-Certified Teacher” by agreeing to education standards. Create an online registry or database of northeastern permaculture teachers that have agreed to community standards and are PAN members. Registry could include teacher bios and be searchable by topic or location. The goal of the registry would be to improve transparency about who the teachers in our region are. Encourage peer to peer review. Our network is a valuable resource and we can learn so much about teaching permaculture from each other. PAN teachers could visit other permaculture classes taught by PAN teachers to provide feedback and mutual support. Encourage mentorship. PAN teachers can assist other beginning permaculture educators in learning/integrating education standards into their own work. Explore models of accountability to ensure Permaculture teachers who have agreed to community standards are upholding them. A small sub-committee has formed to take these standards, refine them, and build from the suggested implementation steps to come up with a plan for rolling out the pilot standards publicly in the fall. The hope is that these standards will be refined further as more feedback is received from other teachers/practitioners in our community and will be revisited on a consistent basis to ensure they evolve as needed. This is a grassroots, bottom-up approach to developing and rolling out pilot standards. Your input and feedback is imperative to this process! 2016 – What did PAN quietly accomplish? The end of 2016 and the beginning of 2017 has been a powerful and transformational time for PAN. 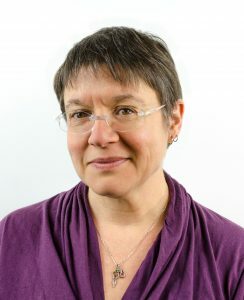 We officially changed our name from PINE to PAN to reflect our goals and organizing strategy, a decentralized network rather than a top down institution, we hired our first paid staff position, organized two diversity trainings for our teachers and are well on the way to implementing the first grassroots set of voluntary teaching standards for our region. 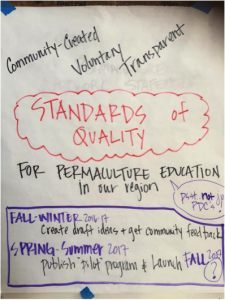 We are exploring more connectivity and alignment between permaculture teachers in our region by creating community-derived standards for permaculture educational quality. We started this process by first getting an overview of what processes other countries and regions use to decide who can be permaculture teachers. We also heard a report back from a board member who was a part of a conversation around teacher qualifications at the recent NAPC (North American Permaculture Convergence). We then built on conversations at retreats we have hosted over the last 3 years on how our region could take a bottom-up collaborative approach to defining quality standard that were developed with teachers in our region. We broke up into small groups and brainstormed answers to four questions: 1) Why is a system of standards important or useful? 2) What content considerations should be included in a quality standard? 3) What pedagogical (how we teach) or ethical considerations should be part of a standard? 4) How might PAN best implement and maintain a voluntary community-created system? We built upon this work at the winter retreat at D Acres. Some of the highlights that came out of this conversations were how to support the on-boarding of new teachers and maintain a culture of openness and integrity. 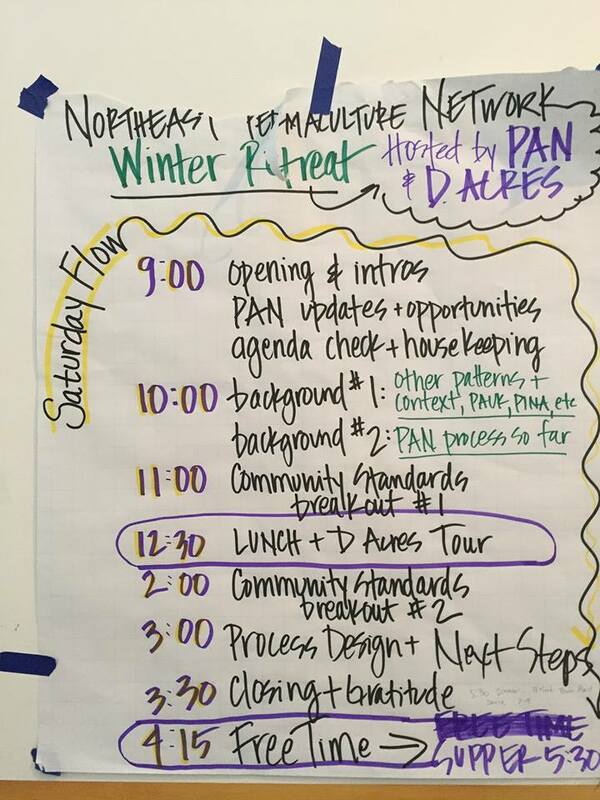 This February, PAN built on our previous conversations around standards for permaculture education at the D Acres Farm and retreat center in Dorchester, New Hampshire. Our group consisted of educators from Maine, Massachusetts, Vermont, New York, Connecticut, New Hampshire and Quebec, Canada. In small groups we deepened the brainstorm that came out of Omega and created a working group to turn our suggestions into an actionable pilot program for 2017We honored our outgoing board members and had great time over food, music, dancing and Ping Pong. PAN Member, Liz Kelley, wrote a great article to tell you more. Keep poking around the website to find it! This past October the Permaculture Association of the Northeast (PAN) organized a deep and vibrant gathering of 27 teachers from the up and down the Northeast United States and Canada at the Omega Institute in Rhinebeck, New York. We gathered over many meals, fires and facilitated spaces to support permaculture teachers to continue improving the quality and outcomes of educational offerings and experiences, and to continue building a culture of mutual aid and reciprocity. Below you will find an brief report back from the gathering. Click here for a full version of the notes from the first day of the training including a resource list and detailed notes on retelling the permaculture origin story. The goal for this event was to increase the resilience of the Northeast region by strengthening the regional permaculture network and facilitating access to relevant education and resources. We recalled at the 2014 North American Permaculture Convergence (NAPC) there emerged requests from the People of Color Caucus to center the topics of social justice, racial justice, anti-oppression and equity within our work. During the first day of this capacity building and professional development gathering we responded to those requests with a day long diversity training with Relational Uprising. Through unpacking dominant narratives, physical movement and sharing our own stories we learned that we don’t gain justice by merely increasing representation through tokenism, or shaming individuals for systemic problems. We gain justice from learning how to cultivate a culture shift in our community, deconstructing oppressive beliefs and stories and coming to embody our shared values. You can view a copy of the slides from the training here. A delegation from this one day training is going to continue building on what we learned and network with other activists, organizers, movement builders and changemakers from diverse fields to build healthy, interdependent, relational culture in a four day training this December. Look for future report backs from this event. 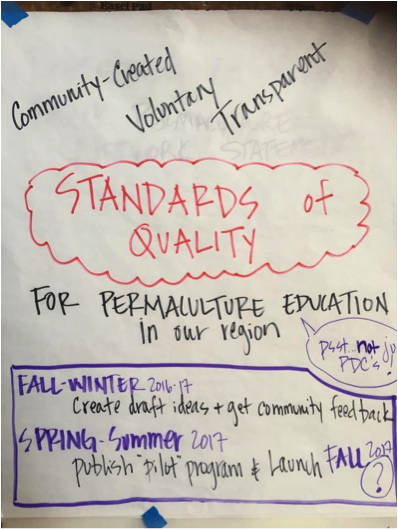 We spent the second day exploring more connectivity and alignment between permaculture teachers in our region by brainstorming community-derived standards for permaculture educational quality. We did this by first getting an overview of what processes other countries and regions use to decide who can be permaculture teachers. We also heard a report back from a board member who was a part of a conversation around teacher qualifications at the recent NAPC (North American Permaculture Convergence). We then built on earlier conversations on how our region could take a bottom-up collaborative approach to defining quality standards for teachers in our region. We broke up into small groups and brainstormed answers to four questions: 1) Why is a system of standards important or useful 2) What content considerations should be included in a quality standard? 3) What pedagogical (how we teach) or ethical considerations should be part of a standard? 4) How might PAN best implement and maintain a voluntary community-created system? During our February organizers retreat at D Acres in New Hampshire (February 24th and 25th) we will continue to winnow and come up with a draft round of voluntary standards that teachers will be able to pilot in 2017. We would love your feedback and input on these questions. You can see the results of the questions and add your own feedback here. The remaining part of the gathering was reserved for creating space for professional level peer-to-peer sharing and cross-training on quality educational and organizational practices for the permaculture community. We closed our gathering with several announcements including that PAN is hiring a part time virtual assistant and is looking for new board members. Information and a job description is available on our website. We thank everyone who was able to devote their time and resources to this event. For PAN members who could not attend, we invite feedback on community standards for quality permaculture education in our region. 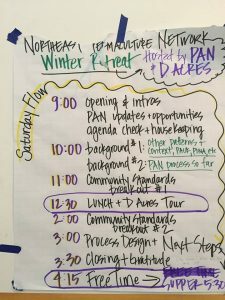 If you are not yet a member, please join PAN today to keep supporting our network with events like these and our upcoming winter retreat at D Acres.